Posted on: August 20th, 2018	by Melanie C.
This post was sponsored by Morey’s Piers who provided passes and a food voucher to make our visit possible. Every year my family takes a vacation to Wildwood Crest. Our days are spent biking, boogie boarding, catching up with friends and of course enjoying the boardwalk. As my children have aged the boardwalk experience has changed; from early morning stroller rides to family bike trips, from kiddie rides to fast roller coasters. The constant has been how much we all look forward to and enjoy the attractions of Morey’s Piers. They offer so much for all age levels in an organized and safe environment that keeps us coming back yearly. Take a look at why we think your family will enjoy this South Jersey amusement park and waterpark as much as we did. Morey’s Piers is a Southern New Jersey theme park that offers games, arcades, thrill rides, water rides and plenty of fun for everyone. 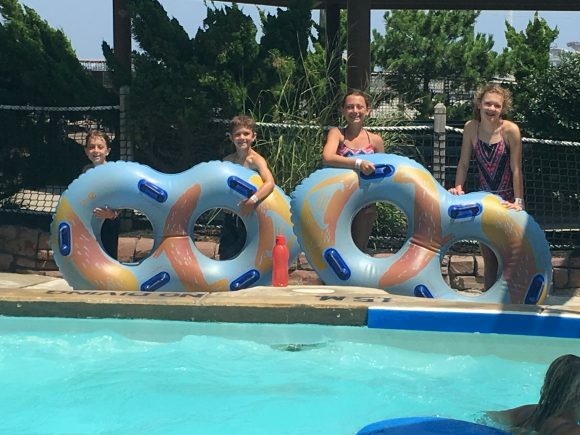 Morey’s occupies three piers across North Wildwood and Wildwood, and all sit on the FREE Wildwood beach making Morey’s one of the most fun places to visit for families this summer. 1. Visit Morey’s Piers for the Waterparks! With two waterparks at Morey’s Piers it’s no surprise that every age can find a way to have fun. What I like most is that even the older ones still enjoy what’s meant for the littles! You’ll see plenty of older “kids” enjoying the lazy river, splashing in Camp Kidtastrophe and racing on Wipeout. You can bring food inside the parks or dine at the grab and go or restaurants available inside. Cabanas are available to rent if you can’t find chairs (it does get crowded on peak summer days), and one admission price gets you into both parks. All this right on the beach in Wildwood makes for some picturesque and fun family time. Camp Kidtastrophe is the splashpad/play area at Raging Waters and it’s HUGE! Evoking a Neverland camp sort of fun play area, it’s filled with small water slides, water guns, and more over three levels. It’s a perfect place for the family to battle it out with water sprays, or have the parents take a seat right at the edge while the kids play. Lifeguards are all over to keep everyone safe, and watch out for the bucket drop! 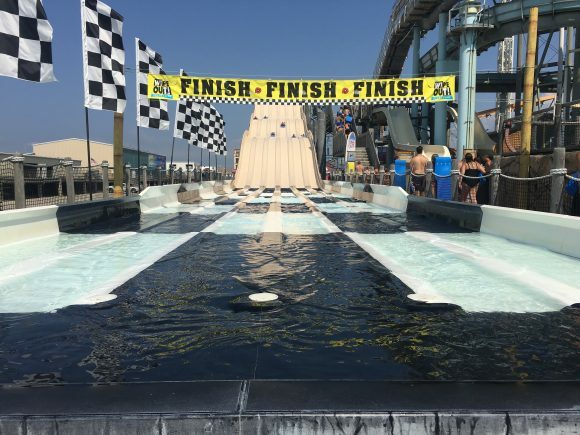 Wipeout at Morey’s Piers’ Ocean Oasis is a great place to see just who is the FASTEST on the water slide. You can race up to 6 at one time! Grab a mat, climb 40 feet to the top and slide down 350 feet! Will it be the heaviest person or is there a strategy? Lines for this ride were short since it can accommodate so many, so my crowd rode it again and again! Endless River/River Adventure is mom’s favorite – no thrills just relaxation! There’s a lazy river at both Morey’s waterparks and in my vast lazy river experience I find these to be the best! There’s just enough push for you to keep moving forward while not using any muscles and isn’t that the BEST way to be lazy? Mom doesn’t like to do fast water slides, so Sky Ponds is our favorite family slide and a must do when we visit Morey’s Piers! Sky Ponds starts high but moves into 4 elevated pools, with lifeguards along the way. Share a tube or double up – there’s a little splash at the end but no going under! Safe for mom but still fun for the kids. This time they didn’t even want mom to join them! Learn more about these and other waterpark rides and slides and their height requirements at their site. 2. Enjoy the Boardwalk Rides when you visit Morey’s Piers! Nights on the boardwalk are so much better when accompanied by thrills and the shouts of kids on rides. 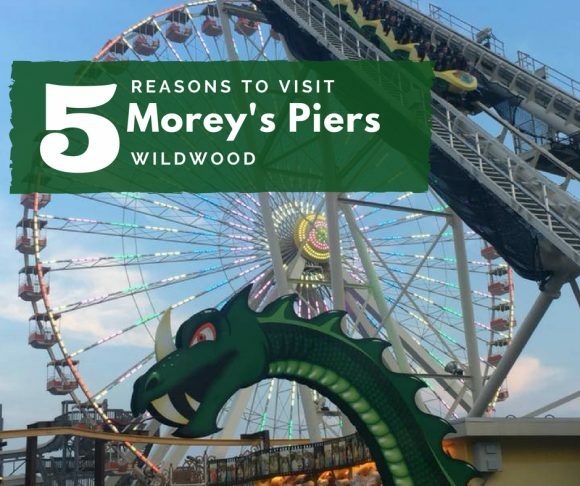 Morey’s Piers has THREE piers with rides – so much to offer that if you’re spending a week at Wildwood you can visit often and not be bored. Just spending the day? Start early! In peak season, the Morey’s Piers rides open at 1 PM. There are rides for all ages and a couple serious roller coasters you won’t want to miss. The piers are spread out but there’s the famed tramcar that can take you along the boardwalk if the walking is too much. As soon as you get anywhere near Mariner’s Landing you’re going to see the 156 foot Giant Wheel! Lit up at night or shining in the daytime sunlight this ferris wheel is one of the biggest we’ve ever been on. The sights of the whole island and out to sea are so memorable – you really have to ride it all times of day for a different ride everytime. The Great Nor’Easter ~ If dropping 95 feet, going upside down and FAST is for you then don’t miss out on this serious boardwalk roller coaster. All loose articles must be locked up before riding on this intense but smooth ride at Surfside Pier. If you haven’t been to Morey’s since before 2016 you need to experience the upgrades on The Great Nor’Easter – it’s definitely a fan favorite. Want to feel like you’re flying over the boardwalk? The classic pirate boat ride can be found at Mariner’s Landing Pier, on the edge of the boardwalk so you feel like you’re flying right over the sand. 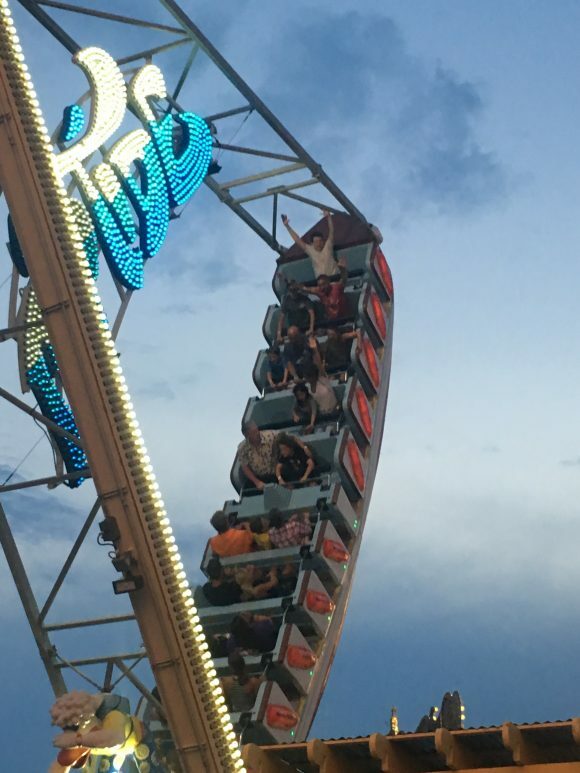 Riptide is a family favorite and depending on what row you choose it can be mild or intense thrills! It’s almost as fun to watch the faces of the riders as it is to ride. Learn more about these and other Morey’s Piers amusement park rides and slides and their height requirements at their site. You cannot visit the boardwalk and not eat! Ice cream, seafood, lemonade or a filling meal, Morey’s has it all for you. 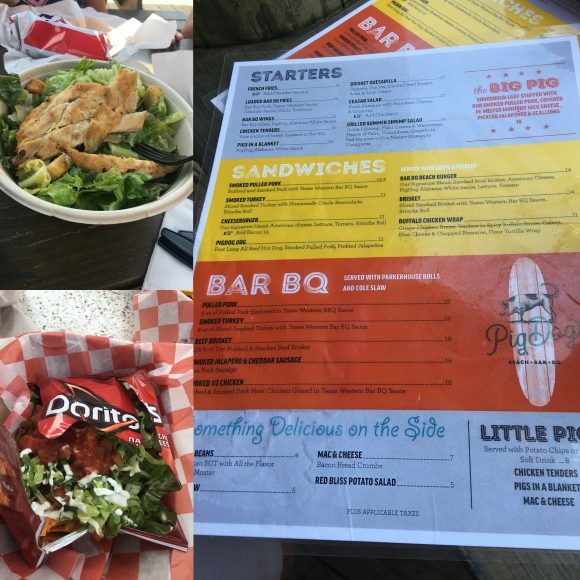 During our waterpark visit we tried the new PigDog Beach Bar, located at the end of Mariner’s Landing Pier. Dogs are welcome (ours was visiting Wildwood with us but it was a hot hot day), it’s a shady respite where you can watch the waves, and during lunch there was live music. The menu is small and offers mostly sandwiches but there’s a kids meal option which is always appreciated! And at a place called PigDog of course we had to get pigs in blankets! Our past favorite, Stubborn Brothers is at the end of Surfside Pier and is also a relaxing stop while you are waterparking for the day. 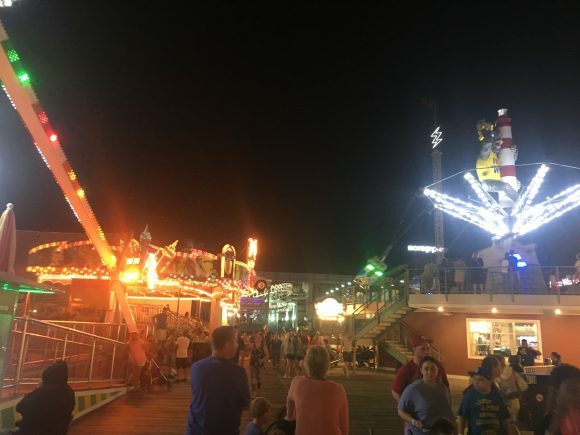 On the boardwalk, Morey’s has a restaurant on each pier for your sit down experience – IF you can resist the boardwalk favorites of hot dogs, pizza, ice cream and the FRIES! Everyone gets Curley’s Fries at Morey’s! Looking for something different? Bet you never had a crepe on a Jersey Shore boardwalk but you can get one at Morey’s. My personal favorite is The Taco Joint where I get a walking taco, served in a Doritos bag. Yum! Morey’s Piers ride piers are open to all who want to experience the boardwalk! Stroll around and go on a ride or two with single ride ticket options, or ride all night with one of their ride pass specials. Tickets don’t expire! If you have Morey’s tickets from vacations past bring them and they’ll load them onto a card for you. The waterparks, which are at the far end of the two piers, are admission only. Hours vary for the parks and pier rides, but generally you can spend from 10 AM – midnight on your visit Morey’s Piers trip. Combo passes for both waterpark and rides are offered AND you can use the waterpark and ride piers on different days! This is the best option as it can be a LONG day. Joining the family at the piers but not riding? Check out the Parent’s Pavilion where you can take a rest and have a meeting spot with the thrill seekers. Not to fret though, there are plenty of benches throughout the piers with all those stunning beach views. Check out the Morey’s Piers website for up to date ticket specials! Morey’s Piers is located on the boardwalk in Wildwood, New Jersey. Guest Services can be found on all three piers. Admission prices and hours vary, please see their website for more information. For more on our trip to Morey’s Piers check out our photos on Facebook. See our past visits to Morey’s Piers here and here. 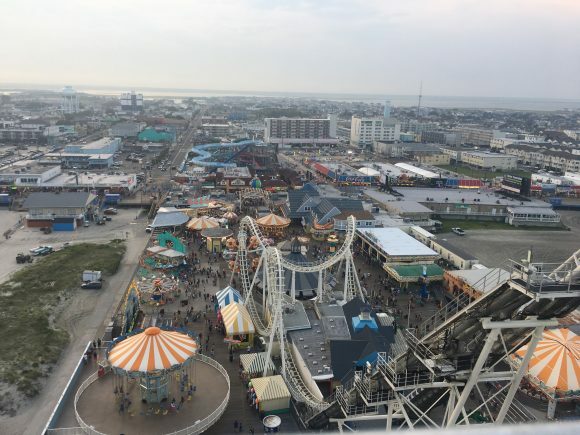 Morey’s Piers – Wildwood’s Destination for Fun! 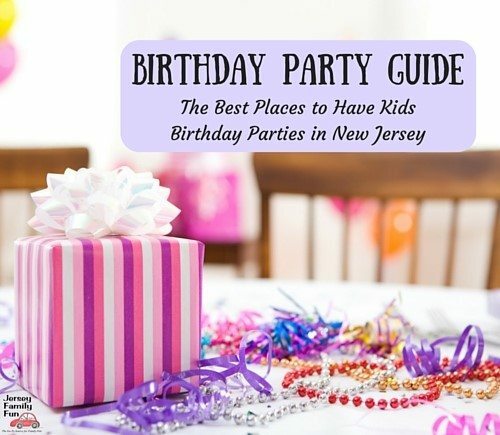 For more information on other local waterparks visit our Splash it up at these Local Water Parks in New Jersey guide. 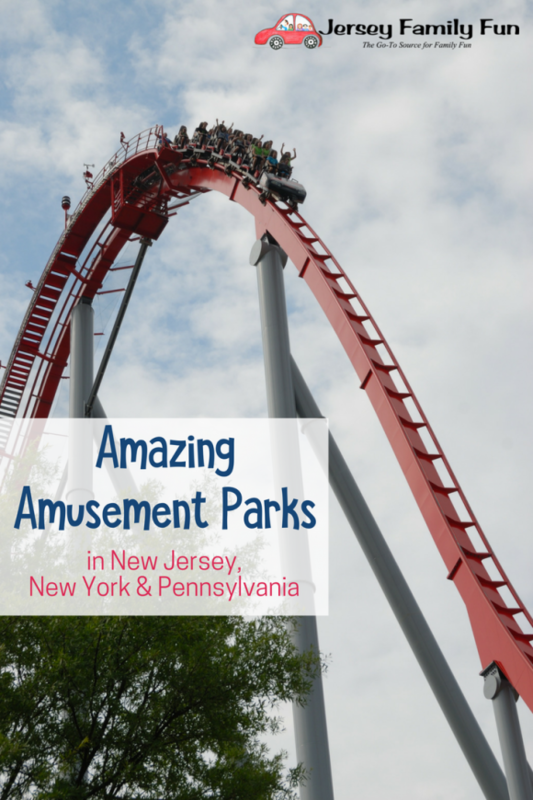 For more about local amusement parks click over to 20 Amazing Amusement Parks in New Jersey, New York & Pennsylvania That THRILL Kids.